Hot Hot Wicked hot. I?m speaking about the weather. LOL. But the fishing isn’t too bad either. This Fort Lauderdale fishing charter report will essentially be about near shore fishing , as the Mahi-Mahi fishing has become a bit hit or miss the last few days. Always love to push out into the deep and this is a good time for big Mahi, but they have been for the most part pretty much halfway to Bimini. Chance for some scattered fish at 8 to 10 miles but most of the ones there are very small. No thanks, especially as the near shore fishing has offered good catches. The Snapper bite has been good out in 300 feet. Most fish are keepers, and they do eat well. Mi xed in with those snappers are some Warsaw Groupers so don’t go too light and lose the chance to land one of these bigger fish. 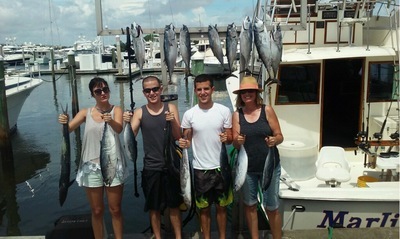 The Kings have bit well at the reef and while fewer those Bonito are still around as well. A Sail here and there at the reef also and although we didn’t catch any Wahoo the last two days we did have a couple of them that got the best of us. Grey tiles were really strong today, and some nice big ones in 400 to 420 feet right out front. There are Swordfish biting and available both day and night, but those bigger Mahi are a good 10 miles outside of the daytime Swords. Once again it’s best to get out early and (try) to beat the heat. The rain has backed off ?.Actually we are forecast to stay below 90 for the next few days. Love it. Sweater weather.